Beside Nha Trang, popular destinations as below: Bali (Indonesia), Kuala Lumpur (Malaysia), Istanbul (Thổ Nhĩ Kỳ), Rio de Janeiro (Brazil), etc. are also voted. Tourism website Price of Travel launched “Ideal destinations in 2014 summer” and Nha Trang, Vietnam is listed. According to the website, Nha Trang is a famous tourist city located on the southeast coast of Vietnam, thanks to be covered by bays such as Nha Trang bay or Van Phong bay, Nha Trang city looks like a perfect natural picture with sea, islands, mountains, rivers, rice fields, villages, etc. 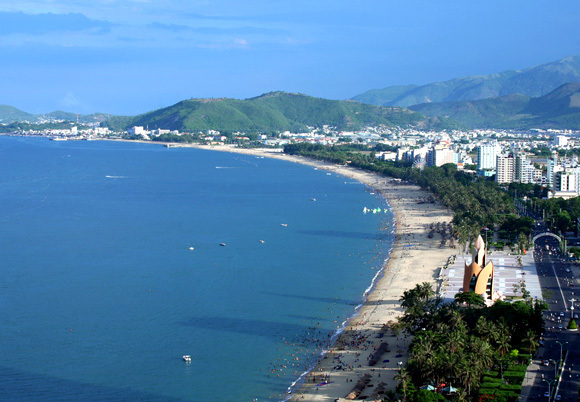 Viewed from high, Nha Trang attracts tourists with white smooth sand and beautiful islands. Must-visit in Nha Trang is Tre islet, Mun islet, Monkey island, Orchid stream, Yen island, Nha Phu pond, Dai Lanh beach, Cam Ranh beach, etc. Nha Trang attracts tourists with white smooth sand and beautiful islands. Unlike other tourist attractions, Nha Trang is described with very little rainfall during the summer, this is great for those who want to swim in blue clear water and sunbathe on nice beaches. Another attractive thing is that cuisine here includes rusty dishes but tasty, for example: jellyfish noodle soup, fish balls, etc. with reasonable price. The room rate here is reasonable, just USD 10, you can relax in a fully equipped room. Nha Trang city is quite peaceful and friendly at night; you can ramble at night market, sip a cup of cocktail near sea coast or be one with exciting music of Clubs, etc. Furthermore, hospitality and friendliness of locals here are another plus point.